At The BBQ Cleaner, we know that you can potentially build a successful BBQ and grill cleaning business in Washington because of the countless service requests we have been receiving from residents here. We are not selling a franchise business and that’s why you are not subject to monthly or yearly royalty fees. The challenge we are facing is that we cannot reach out to all of these homes at once. But with your help, we can extend high quality grill cleaning services to residents of Washington. What’s more, we will be providing the support necessary to help grow your business successfully. If you are looking for a profitable BBQ cleaning business opportunity in Washington, look no further than The BBQ Cleaner. When you choose to work with us, you automatically avoid forking out a huge investment. What’s more, you may even have ZERO experience in the BBQ cleaning industry to start. With perseverance and self-motivation, all you need to do is to reach out to more customers in the state. You will be able to learn on the job as well as from the business guide that will be provided from the get-go. Why Start a BBQ Cleaning Business in Washington? Pleasant Outdoor Weather: Summers in Washington are hot but bearable. That’s why many residents in Washington love spending time grilling outdoors whenever they have the chance. It will be easy for you to offer grill cleaning services. Sizeable Customer Base: In Washington, many homeowners have their own grills. The number of potential customers continues to grow as we speak. No Need to Worry about Competition: Your business is not associated with a highly competitive niche. BBQ grill cleaning services is a specialty niche. Grow Your Business with Ease: You set your own Key Performance Indicators. You decide when to grow your business. How Does The BBQ Cleaner Help You Get Started in Washington? Since our inception in 2009, we have grown our business nationwide with over 180 operators to date. We are a global leader in the BBQ and grill cleaning industry, and you can rest assured that we have both the expertise and experience to help you reach your full earning potential. When you work with us, you will also have access to on-going lifetime business support from THE BBQ Cleaner. 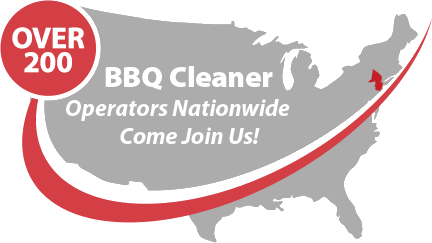 Talk to us today to find out more about this stellar BBQ cleaning business opportunity in Washington!